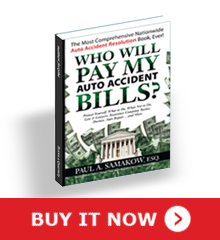 Who Will Pay My Auto Accident Bills? - Paul Samakow, Esq. 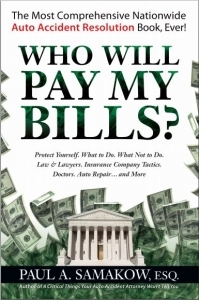 Purchase Who Will Pay My Auto Accident Bills in paperback at Amazon.com and Barnes and Noble. NewsRadio 104.9 FM interviewed Paul Samakow about his book. Listen now! Imagine you are in control of negotiations with an insurance adjuster after being involved in an automobile accident. Imagine that you are providing strategy to your attorney. Who Will Pay My Auto Accident Bills provides you with these otherwise unimaginable powers. Who Will Pay My Auto Accident Bills is the only book that exists that provides information for automobile accident victims, nationwide. This book provides detailed discussion, explanation, strategy and information about what to do for injury and vehicle damage matters, including how insurance companies handle claims and why, how to navigate with that information, what state and federal laws govern a claim and how they affect “bottom line in-your-pocket” compensation, and how police and choice of doctors affect that bottom line. Who Will Pay My Auto Accident Bills provides numerous charts which detail, state by state, every law involved in every aspect of a claim for compensation following someone’s negligence while driving an automobile. Finally, this book empowers automobile accident victims by the sheer volume and detail of the information, such that whether a victim chooses to attempt to represent him or herself, or retain an attorney, knowledge obtained in this book almost guarantees a better financial resolution will be obtained. Who Will Pay My Auto Accident Bills is destined to become the Bible on this subject. Pick up your copy today!